With his re-election behind him, Colorado Governor John Hickenlooper is showing his true liberal colors as a (yes, in true liberal form, everyone is a keynote speaker) keynote speaker at the Center for American Progress Policy Conference today. Here’s a link to the conference agenda. If you were lucky to be sitting in your parents’ basement in your pajamas, you could watch his entire keynote speech. We were and we did. This is a far left wing event, featuring progressive standard-bearers like Sen. Elizabeth Fauxcahontas Warren, Sen. Tammy Baldwin, John Podesta, Sugar Daddy Tom Steyer and New York City Mayor Bill de Blasio. There were even cheers for climate change protesters and the Senate’s stomping on Mary Landrieu the Keystone Pipeline. True to his progressive values? 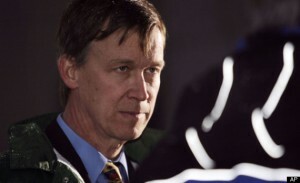 Did Colorado voters realize that Hickenlooper was a liberal to the core when they voted him back into office? Hick noted that his neighbor growing up was Agnes Nixon, the creator of such beloved soap operas as All My Children and One Life to Live. As someone who claims a middle-class upbringing, we have to wonder how middle class an upbringing he has with a neighbor like Agnes Nixon, attended a renowned prep school, and earned a degree from WASP-y Wesleyan. Funny, Hick never mentioned his “progressive agenda” during any of the gubernatorial debates. And, he certainly never mentioned that he had to take a certain tone in order to shove through an agenda. That’s odd. Do Coloradans feel hoodwinked by a guy who has admitted to purposely duping Coloradans via tone in order to pass some of the most extreme legislation in the country? He’s been mentioned as a possible VP candidate because he could presumably provide moderate balance to someone like Warren, who spoke right before him. Was this a tryout? Is he trying to get his name out in front of the big-money DC progressives? FYI for all of you who voted this guy back into office… It did not take him but a week or so to show his true colors.